myoldmac.net - PONG console - 9010 - by R10 - Buy It ! Rare Viedo Console 9010 by R10, Germany - tested - works great. Some scratches on the top metal case but in a good shape due to its age. See the Photos. One more system which looks like the Markint 4A system or the Novoton Video-Sports. 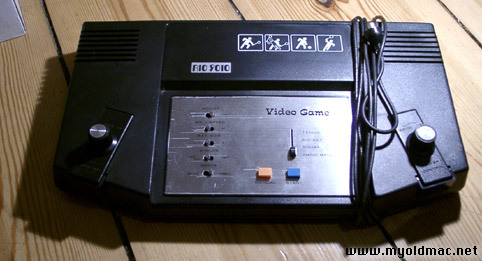 It is in fact a classic pong system powered by the AY-3-8500 chipset and thus offering 4 different games (Tennis, Hockey, Squash and Handball). The system is very large. The middle part looks like a common system but it feels like two additional parts (colored differently) had been added on each side. The paddles can be inserted in these parts which allows the players to play without removing the paddles. Eine Konsole die dem Markint 4A System oder dem Novoton Video-Sports ähnlich sieht.Es ist ein klassisches Pong system mit einem AY-3-8500 chipset, das die 4 Kultgames Tennis, Hockey, Squash und Handball enthält. Ohne Netzteil, braucht einen standart 9 Volt AC Adapter (für 3 € bei Lidl). Das System 9010 ist recht groß und sieht aus wie eine Komandozentrale bei StarWars, die Paddles sind in das Gehäuse eingelassen und man kann sie herausnehmen. Dieses Modell wurde offenbar nur in Deutschland verkauft. 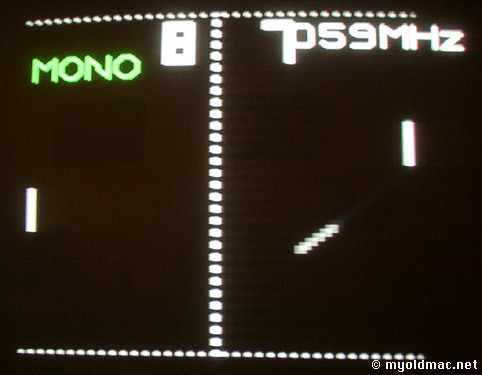 Pong Console Video Game by R10 Model: 9010. Tested, works great. Needs a standart (european) 9 v AC adapter. Tested, sharp screen, you see the MhZ info from my TV set too. Getestet, man sieht noch die MhZ Angaben meines Fernsehers.